To make the vinaigrette, pour the vinegar and lime juice in a small bowl. Add the oregano, salt, sugar, and black pepper. Pour the oil in a slow stream, whisking with a whisk or fork to emulsify. The vinaigrette can be made a day ahead of time and refrigerated, just emulsify before using. To toast the pumpkin seeds, place them in an already hot, small saute pan set over medium heat. Stir often, being careful that they don’t burn; until you start to hear popping sounds (similar to popcorn) and they being to acquire a nice tan, about 4 to 5 minutes. Remove from the heat and place in a bowl. 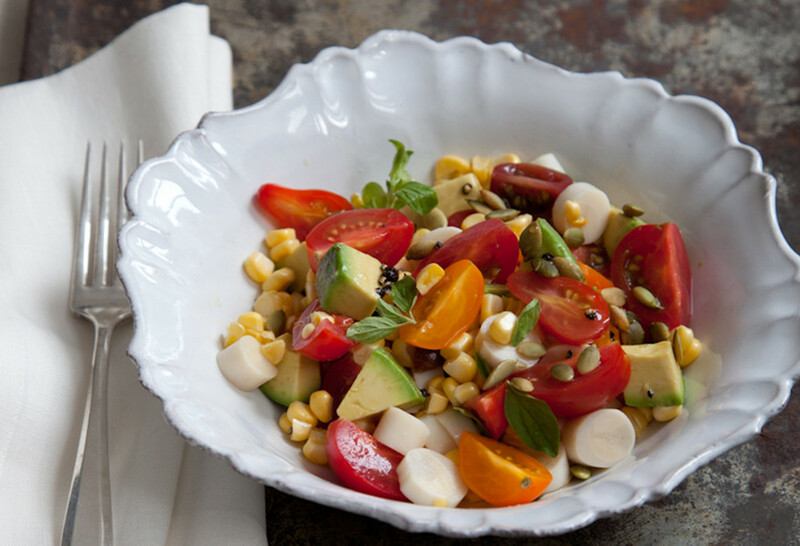 In a bowl, gently mix the avocado chunks, hearts of palm, corn kernels, cherry tomatoes and red onion with the vinaigrette. Sprinkle with the toasted pumpkin seeds and serve. The dish can be served as a main salad with a side of toast or pita bread. Or serve it as a side salad to grilled chicken, fish or meat.